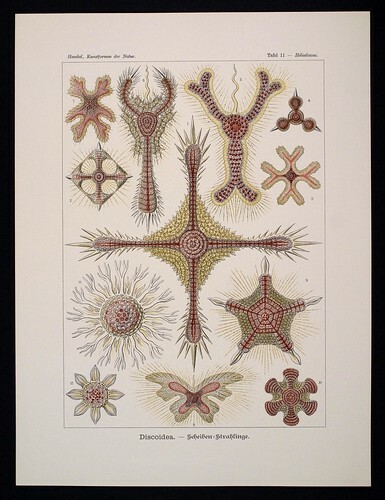 Discoidea, Ernst Haeckel, Kunstformen der Natur. Chromolithograph 32 x 40 cm, Verlag des Bibliographischen Instituts, Leipzig 1899-1904. Photograph by D Dunlop. where $h$, $c$ and $\pi$ are constants. Since $E$ and $𝘑$ have been defined from tallies of quarks, the orbital radius is thus established from quark counts too. But now we use it to make a rudimentary account of the expanse or extent of P.
Any non-rotating particle has an orbital radius of zero. Then a circular perimeter of $2 \pi R$ is the same as one wavelength.